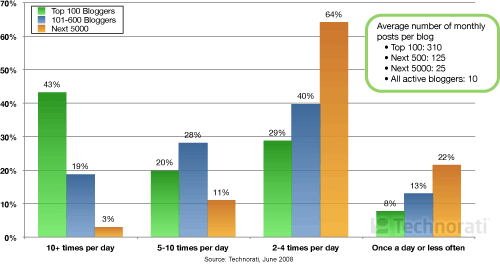 All week, Technorati is releasing data from its 2008 State of the Blogosphere report. On Monday, Technorati told us that bloggers only need 100,000 visitors a month to make $75,000 a year (yeah, right). Today, it offers up something more believable: the more you post, the higher you are likely to rank on Technorati. In fact, about a quarter of all bloggers spend more than 10 hours a week posting, and 66 percent spend more than 3 hours a week. 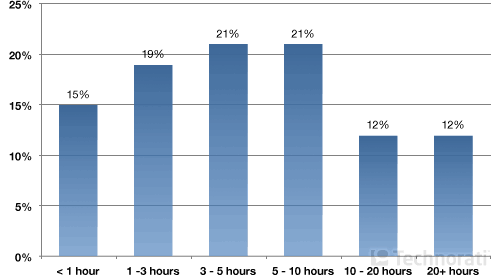 To summarize some of the findings, from the first two days if the State of the Blogosphere report, iCharts, one of our TC50 finalists, put together the following interactive graphs from the data. Mouse over each part of the graph for more information, and use the sliders to limit the data set. Don’t be shy. Most bloggers aren’t in it for the money (but you knew that already). Three quarters do it for pure personal satisfaction. Bloggers measure success by how many posts or comments they can generate on their blog (58 percent), how many visitors they get (53 percent), how many links they receive from other blogs (46 percent), or how many RSS subscribers they can amass (39 percent). In other words, they measure success by how much much recognition they get. Only 16 percent measure success by how much money they make. Update: Here are the first two charts in iChart form for those who want to play around with the numbers.